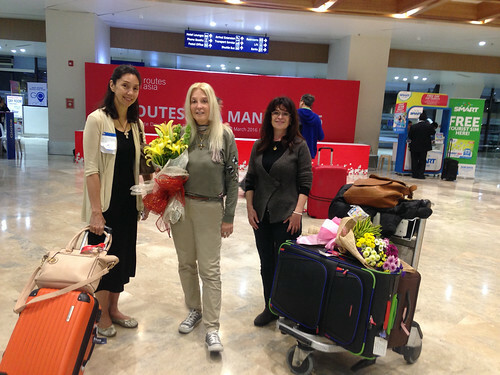 We arrived in Manila on the evening of Sunday March 13, flying out from Fukuoka, Japan. 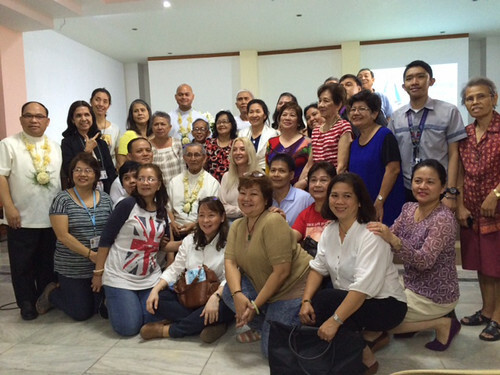 This was Vassula Ryden’s 11th visit to the Philippines and the second country she would visit on her Asia mission, after Japan. At the airport, we were greeted by dear friends: TLIG organizers Cora, Raymond, Servais and Cecilia Lutz. We proceeded to the residence of De Leon, who together with the Center of Peace friends, organized a gathering for Vassula to share her experience with them during dinner. Vassula graciously narrated to our hosts one of the more important stories surrounding Jesus’ desire that we have one date for Easter. This friendly disclosure developed into a lengthy speech by Vassula, as the questions of those present were many. Quite a few of these questions concerned the Message from God the Father that Vassula received on February 13, 2016. Vassula asked all of them to pray daily the prayer given to them by the Father, adding that if you love God, never fear. On Monday March 14, the crew from the Philippines state television channel PTV-4 arrived at the hotel where Vassula was staying, so that the scheduled interview could be taken for the state television’s morning Show entitled “Good morning Boss”. On this show, two days before the interview, a trailer advertised Vassula’s upcoming speech event. Suddenly the journalist surprised Vassula and asked her “Why you?” “Have you ever asked yourself ‘why me?’ the journalist insisted. Vassula smiled and said: “I myself have asked Jesus this question millions of times. Jesus has replied to my question with a question. “‘Don’t you know that wretchedness attracts Me?" Then, when the journalist asked: “and why does God appear now?” Vassula was very surprised: “Are you asking me, why now? Look at what is happening to the world; look at the apostasy! Not only has our wickedness and our godlessness provoked natural disasters… but wars as well as the persecution of Christians… all the evil … She said that in the Old Testament, whenever there was an apostasy, God manifested Himself through His prophets to revive the nations, bring them back to their senses and back to God. This is what is happening now… We are at the peak of a great apostasy, especially in the Western world, and Christians have lost their faith. When you talk to them about God, they mock you… Christianity in Europe has been dying out, and you still want to understand why God is speaking in our times? Will God then not intervene? Or will He sit just up there watching us and not rise up to rescue us? We are talking about God’s Mercy, an undeserved Mercy…so yes, even in our wickedness, He pities us. And secondly: we don’t question God! The Lord gave me a command: He said: ‘go and Christianize a de-Christianized society…” The interview lasted about 30 minutes. The effect of Vassula’s answers touched the young cameraman so much that at the end of the interview, said to her with great emotion that he would not miss her talk in the Church! The TV team thanked Vassula and left. A few days later, the producers of PTV-4 decided to air the interview on Holy Tuesday, March 22, so as to give it a longer airing time. 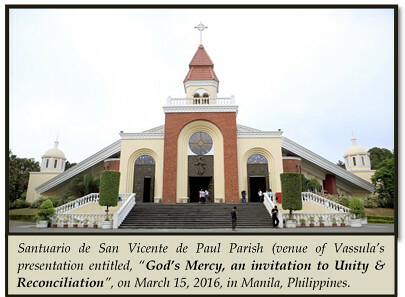 The event that took place on March 15, Tuesday, comprised the main purpose for Vassula’s visit to Manila, wherein she was invited by the Quezon City Ecumenical Fellowship (QCEF) group through the encouragement of His Excellency Most Rev. 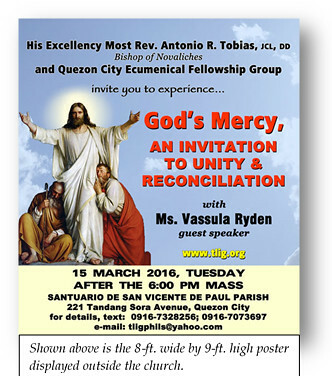 Antonio Tobias, JCL, DD, (Bishop of the Diocese of Novaliches) to speak about: “God’s Mercy, an invitation to Unity and Reconciliation”. 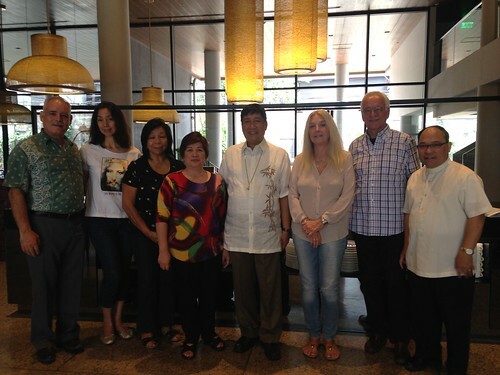 The True Life in God Philippines Association’s involvement with the QCEF began after Vassula had the opportunity to meet Bishop Antonio Tobias, the then Chairman of the Episcopal Commission on Ecumenical Affairs of the Catholic Bishops Conference of the Philippines (CBCP-ECEA) in December 2012. The QCEF is composed of priests, pastors & lay people from the Roman Catholic Church, the Orthodox Church of Antioch, and the different Protestant denominations, including the Focolare, the Lord’s Flock and the True Life in God-Philippines Association. The Quezon City Ecumenical Fellowship organized the program with the purpose of promoting Church unity, joint prayer, spiritual gatherings and human fellowship. Father Rolando Tuazon, a Vincentian priest and parish priest of Santuario de San Vicente de Paul, member of the Quezon City Ecumenical Fellowship group, who took part in the TLIG pilgrimage to Rome, was one of the organizers of the ecumenical meeting. At four o’clock in the afternoon, we departed for the Church of San Vicente de Paul, which holds a capacity of 1500 persons. A short while before Mass, Vassula had a warm meeting in the Sacristy with Ramon Arguelles DD, STL (Archbishop of Lipa). The Archbishop is a reader of the TLIG messages and has participated in TLIG spiritual meetings. As the audience entered the Church of St. Vincent de Paul, they saw the little exhibit which the organizers prepared, comprising a background on Vassula and the TLIG Messages, photos of Pope John Paul-II, Pope Benedict XVI receiving the TLIG One-Book from Vassula and Pope Francis receiving the book, “Unity, virtue of Love” with excerpts from TLIG, from the Armenian Archibishop Kissag Mouradian. The exhibit also showed photos of TLIG Prophecies, the Ecumenical Pilgrimages and the Beth Myriam. Before Vassula’s speech, Bishop Antonio Tobias together with thirteen clergy celebrated Mass. This grace-filled event began with the 6:00 PM Holy Mass that was celebrated by Bishop Antonio Tobias, and concelebrated by Archbishop Ramon C. Arguelles, Rev. Msgr. 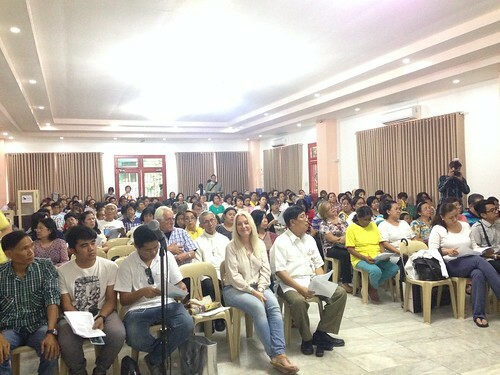 Fred Kriekenbeek of Cebu, Rev. Fr. Julio Gaddi Jr. of Calbayog (spiritual adviser of TLIG-Philippines Assoc. ), Rev. Fr. 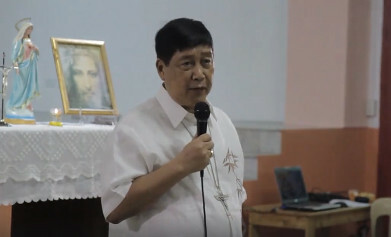 Roland Tuazon, Rev. Fr. Delio Ruiz, SCJ (an Argentinian, and formator of the Seminary of the Congregation of Priests of the Sacred Heart of Jesus, who was able to attend the 2013 TLIG Pilgrimage in the Holy Land), Rev. Fr. Indra Pamungkas, SCJ (an Indonesian, who was able to attend the 2015 Pilgrimage in Rome), Rev. Fr. Raul Abetria, CM (a Vincentian priest working with TLIG-Philippines in Binangonan), Rev. Fr. Johnathan Letada, SVD, Rev. Fr. Rudy Tulibas (priest-in-charge of Ecumenism in the Diocese of Novaliches and member of QCEF) and two more Vincentian priests. Pastor Kenneth Aguilera co-Chairperson of the Quezon City Ecumenical Fellowship (QCEF) and administrative pastor of the Unida Ecumenical Church member church of the National Council of Churches in the Philippines. Bishop Racquelito Jarena of the Apostolic Catholic Church (ACC), a member church of the NCCP; who also came with members of his congregation. TLIG readers from different parts of the Philippines. After Mass, Fr. Rolando Tuaron introduced Archbishop Ramon Arguelles, Bishop Antonio Tobias and all the priests from different communities who were attending. He thanked Vassula for coming to the Philippines and welcomed her to the Ecumenical Fellowship. While waiting for the program to begin after the Mass, the prayer “Abbun Dbashmayo” was sung. A subsequent prayer for Unity was followed by a “Doxology Liturgical Dance” given by the Psalm Ministry Dancers from The Lord’s Flock Catholic Charismatic Community. Pastor Kenneth Aguilera, delivered the Welcome Remarks. Vassula was then introduced by Rev. Fr. Julio Gaddi Jr., spiritual adviser of the TLIG-Philippines Association. Vassula began by inviting everyone to pray together with her the “Abbun Dbashmayo” (‘Our Father’ in Aramaic). 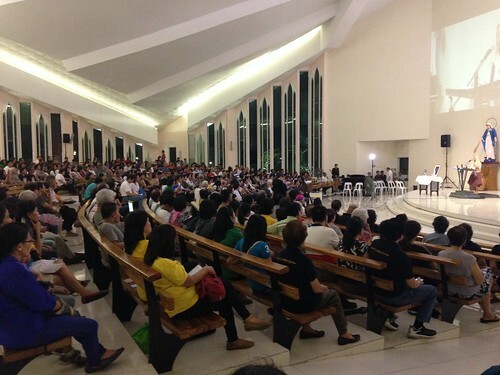 After the prayer recitation, she thanked Archbishop Arguelles, Bishop Tobias and all the priests attending. Since many ecumenical Christian denominations with their leaders were present, she read out-loud the Message on Unity that Jesus Christ gave her in June 2015, which she had previously shared at the TLIG pilgrimage in Rome. Jesus Christ needs new apostles who are like warriors of faith, to witness a resurrected Christ and proclaim a living God to those who today scourge Him, spit on Him and re-crucify Him through their incredulity and their sins. This message proves that the Christian world has been falling apart. It proves that since God had foreseen the apostasy of our times, in His Wisdom, prepared these apostles before they were born, by filling them with spiritual gifts to be used when needed. Throughout their lives, God schools them, and then sends them out on a spiritual battle into a world of darkness, where everything that should be good is transformed into evil. With the help of the Holy Spirit before them as their Guide and Light, He would lead them in their mission to preach the messages: messages that come from the Mouth of God. These new apostles know that they are not qualified in themselves to claim anything as their own work; they know that all their qualifications come from God Himself, for His Salvific plan. He is the one who has given them all the knowledge and qualifications to be the mouthpieces of His messages. These messages do not come from a human mind, but are messages given by the Holy Spirit; indeed, a prodigy is brought to life because it comes from the Spirit. Vassula, like other souls has been chosen by an act of Mercy has been entrusted with the Work of God: this divine message. God once said to Vassula, warning her that there should be no weakening on her part, that He provides her and other souls who attain this Grace with the gift of fortitude, and endurance. The Holy Spirit empowers her and other souls who attain this Grace, with courage so that even though the message itself might frown or irritate certain spirits, they will never water down God’s Word’s of justice. Jesus once told Vassula that He chose her because He knew that His Word would not fall into quicksand and disappear, buried beneath, but that His Word will be planted on fertile ground. As many other gifted souls, Vassula has been encountering on her way, unbelievers, who never saw these messages as the Work of the Spirit, and hence became frenetic persecutors, wasting a whole lifetime uselessly persecuting her with slander. In spite of all the persecutions that these gifted souls go through, there is no spiritual weakening on their part, never! Being armed with the weapons of righteousness both in their right hand and in their left, these apostles never falter; they continue witnessing, in tranquility, a Resurrected Christ, glorifying God all the way. This mission, of course, concerns each Christian today; we are asked to put our trust in God: to go forward to witness the Word of God fearlessly. Vassula, that evening, concluded her speech with the prayer that Yahweh had given her on February 13, 2016. After reciting this prayer, she asked the people to rise and read out the prayer for healing and deliverance that Jesus Christ had given her on November 13, 2006. At the end of the speech, a delegate of the Focolare movement, whose spirituality focuses on unity, thanked her, saying that her testimony glorifies God, and offered her a big bunch of flowers! On the morning of the following day, Wednesday March 16, Vassula had a meeting with Bishop Rodolfo Beltran DD, the current Chairman of the Episcopal Commission on Ecumenical Affairs of the CBCP, who was rather excited to meet Vassula in-person. Bishop Beltran would have liked to, but was not able to attend the TLIG Pilgrimage in Rome, in October 2015, due to medical reasons. The atmosphere between him and Vassula was pleasant. The discussion with Bishop Beltran focused on Church unity, unity in diversity, and the reinforcing of the Church. Vassula mentioned the recent, sad events of the murdering of Christians, saying: “When they killed the Christians, they did not ask them their denomination. They just asked them ‘are you a Christian?’” She then went on to ask Bishop Beltran: “How do you see complete unity, where one can say that ‘now we are united and one: in full communion?” The bishop replied: “Unity is when we all believe in the Word of God.” May God help us unite so that the triumph of both Jesus’ and our Blessed Mother’s Hearts triumph! With Bishop Rodolfo Beltran, Chairman of the Episcopal Commission on Ecumenical Affairs in the Philippines and some of the organisers. The event began with a TLIG prayer meeting. After the reading of the Gospel and the TLIG Message on the theme, “Mama Mary, our Ark of Refuge” and while the prayer meeting was going on, Fr. Lawrence Aleria (an Antiochian Orthodox priest), Fr. Julio Gaddi Jr. and Fr. Ramil Oraiz, OCD, made themselves available for Confession. Mass was then celebrated by Fr. Julio Gaddi, Msgr. Kriekenbeek and Fr. Ramil Oraiz, OCD, a Carmelite priest, who has been reading TLIG since he was a seminarian. In his speech, Fr. Julio, who has been a staunch supporter of the Messages in the Philippines and has taken part in the pilgrimages for several years, stressed that Βeth Μyriams are the way to show God’s mercy. This mercy is revealed and is fulfilled in each one of us. The True Life in God Messages remind us to perform acts of love, and the Beth Myriams are a manner of showing our gratitude and love to God. They are also a work of charity! Fr. Julio with the TLIG Philippines Beth Myriam team had enormously helped the province which was desecrated during the November 2013 Super typhoon catastrophe, reconstructing certain buildings, the church, as well as helping the people who were actually left with nothing, by giving them food to clothes and shelter. After the Mass, the three priests and Vassula prayed over the participants individually, as songs to the Holy Spirit were being played and sung by the choir. The last part of the program encompassed a photo session of each prayer group with the clergy and Vassula. I have an on and off battle with my carpal tunnel syndrome. Days before we had a Lenten Recollection with Vassula, it attacked me most likely because I was carrying our bags during our travel from Cebu to Manila to attend all the activities. I tried to pacify it by moving my arms and wrists just to ease the numbness, but it didn’t cease. When the time came for us to be prayed over at the recollection, Vassula was the one who prayed over me. I felt something lay above my head and knew that was Jesus’ cross. Before that blessing, I had really prayed hard to the Lord to heal me. Minutes after the healing prayer, the pain and the numbness on my wrist disappeared until days after. It didn’t come back until we finally reached our home in Cebu. Praise be to the Lord that He healed me! Thank you, Lord and Mother Mary! Amen! The following morning, we departed for Jakarta, Indonesia, the third country of our Asian Mission. The Asian tour was not yet over.